With a stay at Best Western Plus Grand Strand Inn & Suites in Myrtle Beach (South Myrtle Beach), you'll be within a 5-minute drive of Family Kingdom Amusement Park and Myrtle Beach Boardwalk. 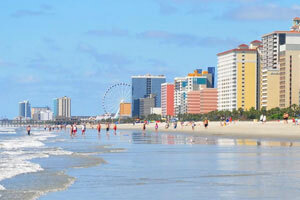 This motel is 2.2 mi (3.5 km) from SkyWheel Myrtle Beach and 3 mi (4.8 km) from The Market Common. Make yourself at home in one of the 121 air-conditioned rooms featuring LCD televisions. Bathrooms have shower/tub combinations and hair dryers. Conveniences include safes and coffee/tea makers, and housekeeping is provided daily. The preferred airport for Best Western Plus Grand Strand Inn & Suites is Myrtle Beach, SC (MYR). This property requires guests to present valid ID and the credit card on file at check-in. For more details, please contact the property using the information on the reservation confirmation received after booking.